Windows 7 RC x64 or x86 do not ship with ActiveSync or Windows Mibile Device Center (WMDC). If you require ActiveSync & WMDC functionality on your Windows 7 computer, this article will show you how to install and active it. 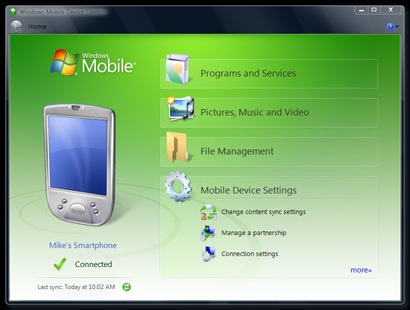 Windows Mobile Device Center (WMDC) is the new name for Microsoft’s ActiveSync which originally came out with Windows Vista. It is designed to synchronize various content including music, video, contacts, calendar events, web browser favourites, and other files between Windows Mobile devices and the Microsoft Windows operating system. Windows 7 x64 and x86, did not ship with ActiveSync (WMDC), however it was supposed to download all the required bits automatically in the background. Sometimes this does not work, at least it didn't work properly when I tried it on Windows 7 RC. Therefore, synchronization would never work out of the box. This is particularly frustrating if you're the type of person who likes to work with the latest Windows 7 versions (in this case Windows 7 RC). Actually this part is pretty easy, simply download the latest version of Windows Mobile Device Center (WMDC) for Windows 7 from the Microsoft website (at the time of writing the latest version was 6.1). Follow this link to Download Windows Mobile Device Center 6.1. If this link doesn’t work any longer, try visiting the Microsoft website and follow links to the Windows Mobile sections. At the time of writing there wasn't a Windows 7 x64 or x86 version of the download, so simply use the Vista x64 or x86 version of the WMDC (ActiveSync) download as well as the correct language for your Windows 7. Don't worry that there isn't a Windows 7 version just yet, it will still work perfectly. After you download (x64 or x86 version) and install the updated software on your Windows 7, you will find that a new program option is now available to you from the All Programs menu as well as a Windows Mobile Device Center icon on the desktop. If you start Widows Mobile Device Center and plug in your mobile device, synchronization functionality for your Windows 7 should now be re-established. This article has shown how to install and enable ActiveSync (Windows Mobile Device Centre) functionality for Windows 7, which was mysteriously omitted from the Release Candidate (RC).